I think the artist plaque was covered by some sort of construction which seems to be at every station on the blue line this year. 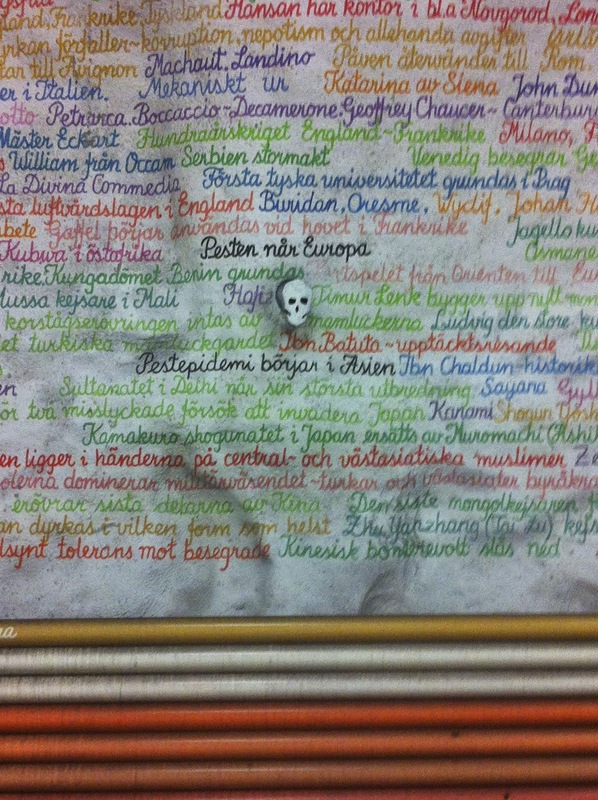 The artist is Birgit Stahl Nyberg. I could not get any information from the web which seems almost impossible - doesn't it? 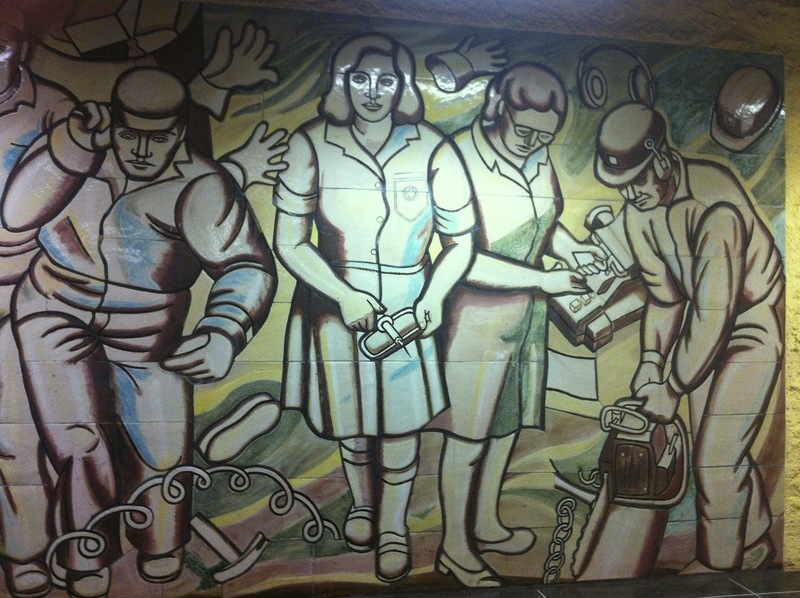 I loved these murals, they look like a 1940s style, in a propaganda style, and were done in the 1970s. They are on tiles, I do not know the how. 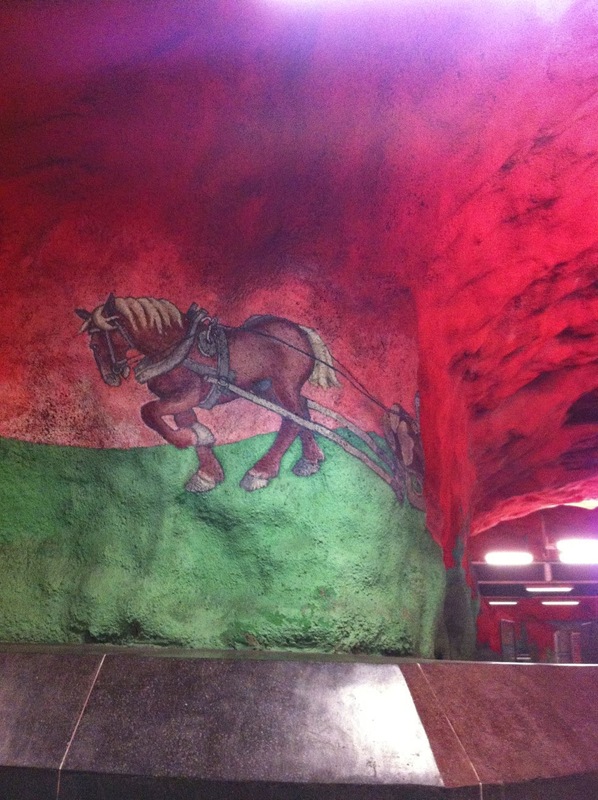 The walls are a lovely ochre- I don't think my phone camera caught the color that well. 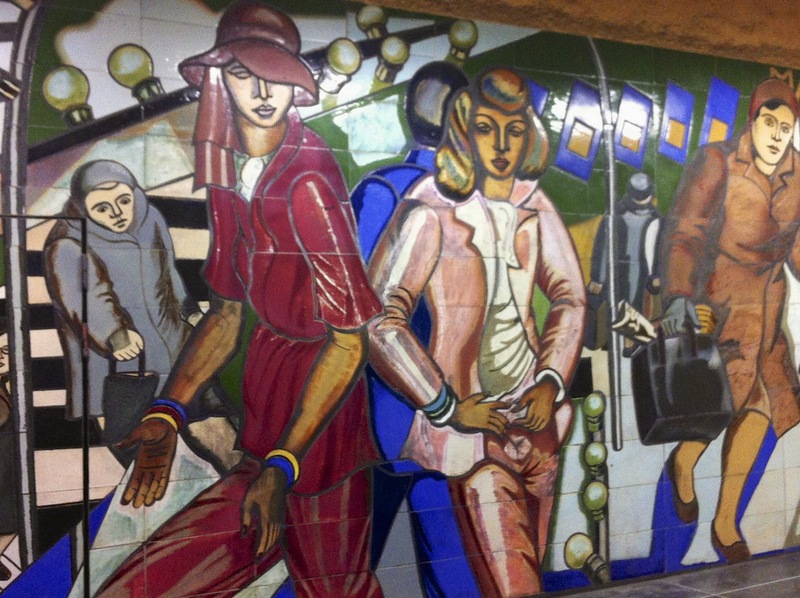 I love the two men dancing, and the murals that are only women. Sometimes, personally I feel art is better without an explanation. 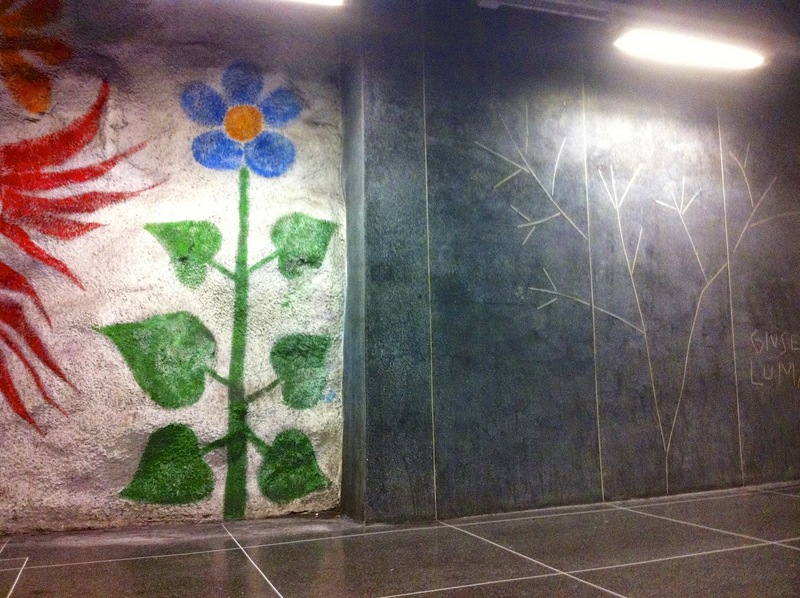 I wish I had seen this station when it was first done, but the others nearby were not completed until the 1990s, so the installation is not that old, and yet I felt I was missing something; better lighting?, a more appropriate season?. I am not quite sure, but I felt as if the panels should some how radiate. The most interesting aspect was that there were panels outside- on the other side of the tracks, which would be interesting to glimpse if one was on the correct side of the train. I will post here the plaque's explanation, I will say that I agree that the station is impressive at speed as you pull in by train, but the glass panels were interesting up close as well, but they seemed more mysterious, or elusive in meaning up close. "Light boxes with secret letter sign is placed on the platform, in the stairwell next to the track area. Fantasy Characters with organic ties are printed on tempered glass and mounted in light boxes. Each image also contains a letter from our known alphabet. An ancient and maybe a new alphabet is followed and placement in the room following letters are from a to z. Light boxes with their signs are placed on the beauty and contemplation viewpoint appropriate places. They should be seen quickly, but also provide waiting passengers something to associate about. " My favorite part about the above translation was the 'a to z' which for Svenska is 'fran a till ö' as the extra vowels come at the end of their alphabet. 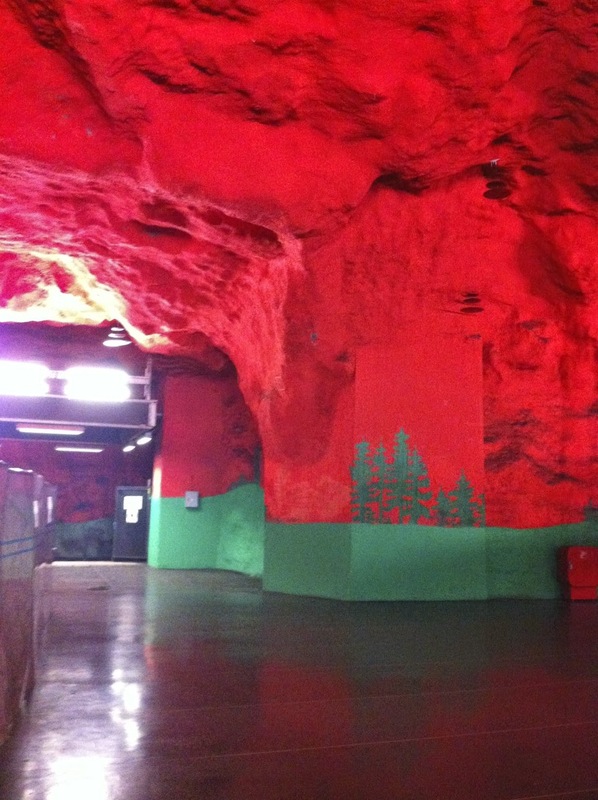 Bagarmossen is definitely one of my favorite stations. I thought that the color panels changed color, but this is a bit of an illusion created when you are pulling into the station. 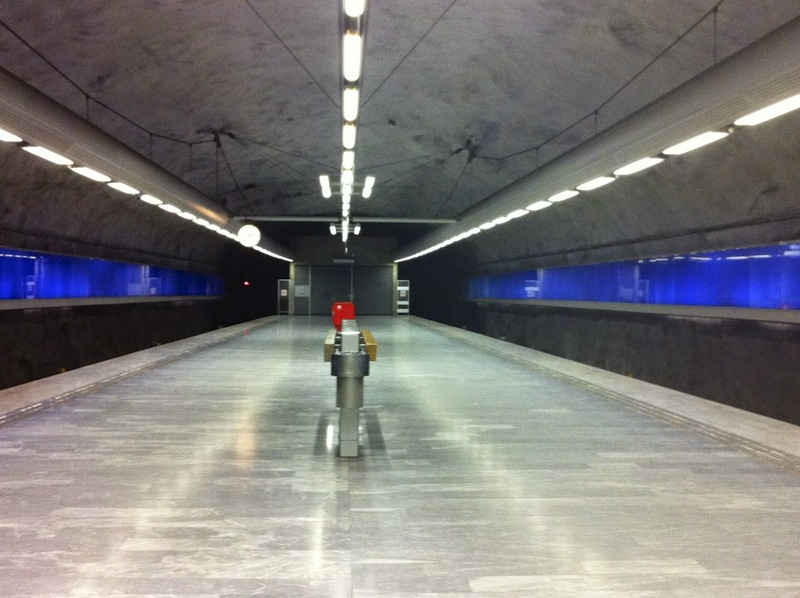 Because Bagarmossen were not opened until the mid 1990s, the advancement in blasting out the line, and ways to work with concrete are the reasons behind this 'light and airy' feeling of the stations. 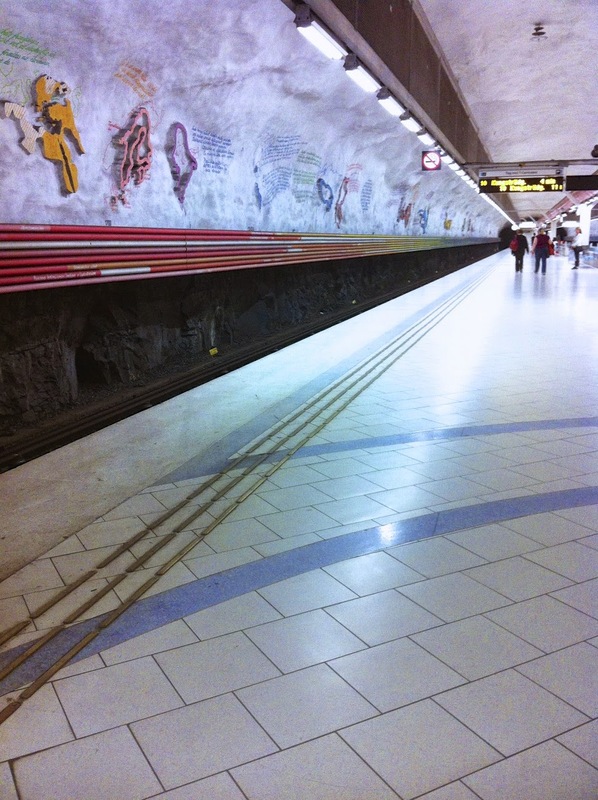 The platform did not need a rock wall to reinforce it. Also the lighting is more modern and suspended from the ceilings. I had originally thought the areas of rock walls (which aesthetically I like, but variety is nice) were because those stations were larger. However, my ability to gauge spacial areas is really, really bad. The floor marble was picked by the artist to help accent the colored panels which are consisted of 228 panels of glass and all back lit. 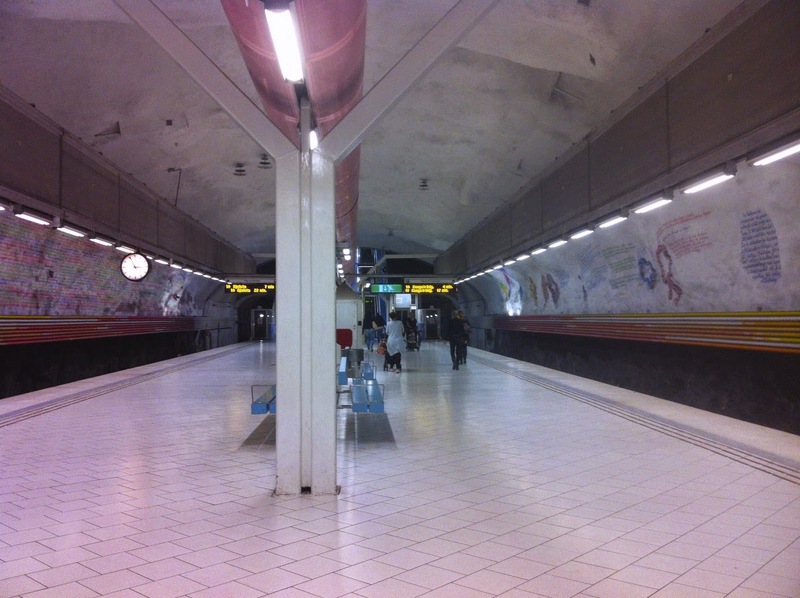 The station has been almost empty each time I have been here. 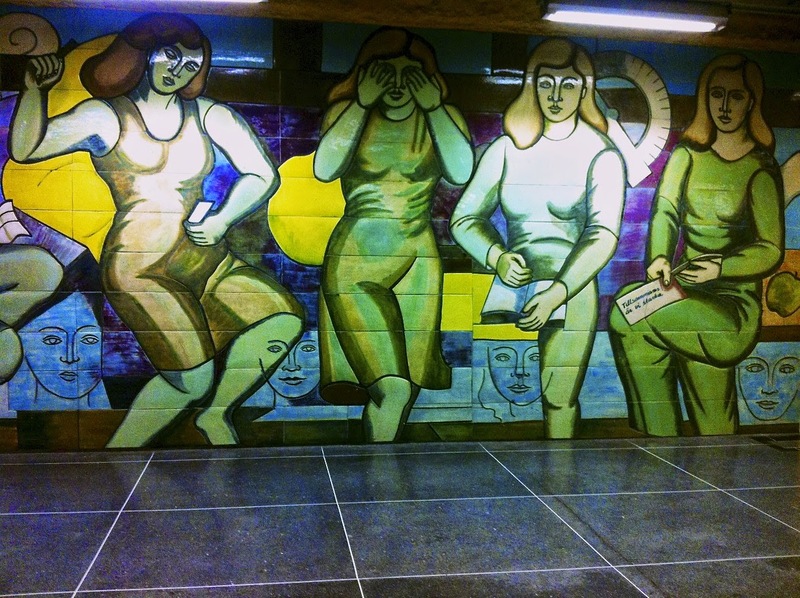 If I had a criticism about the subway art, it would be that the lighting is never set up for viewing the art. Of course the lighting is set up for safety and utility but wouldn't it be lovely to have a viewing session where the lighting was set up to show off the art? 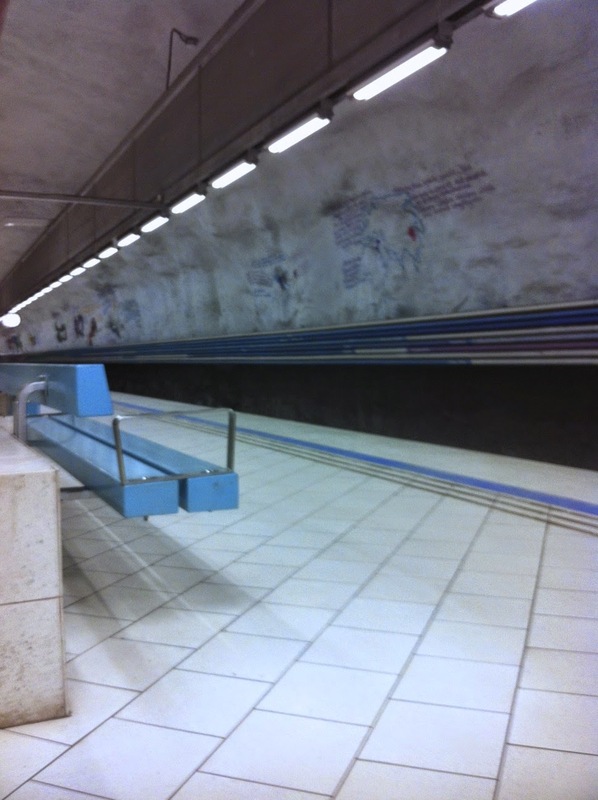 Platform art which is usually sculptural (and fairly minimalist) might suffer when compared with the large grand stations like; Rinkeby, Västra Skogen, or Hässelby. I thought I should group them into a series of three because they are a bit brief. 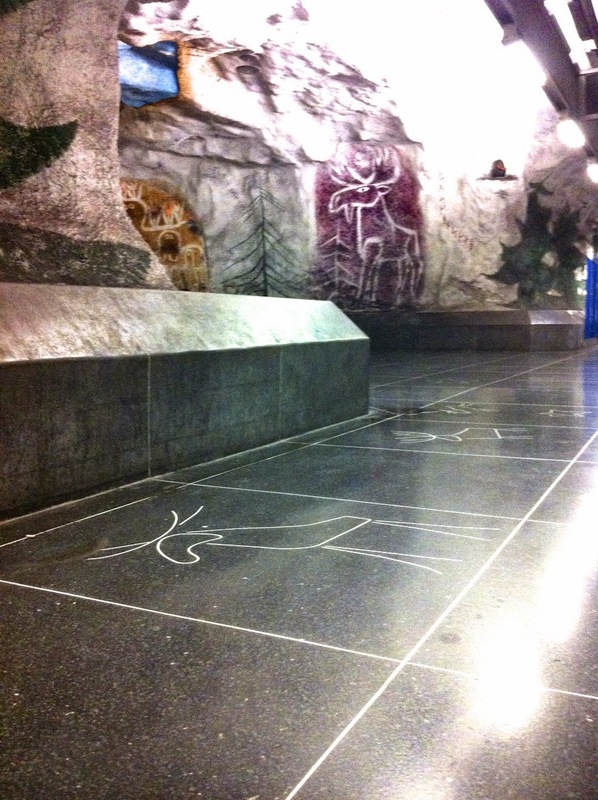 The birch tree limbs in the box are meant to tie together with the X you see above the stairs when you exit the station. A person could miss something by simply running for a train, or not bothering to turn a full circle to look at the surrounds. I wondered if there would be some deep meaning, often the description of the more simplistic, modern art will have some grand explanation. However, once I translated the station name, to find it meant Birch Grove well that is basically the beginning and the end of the mystery. 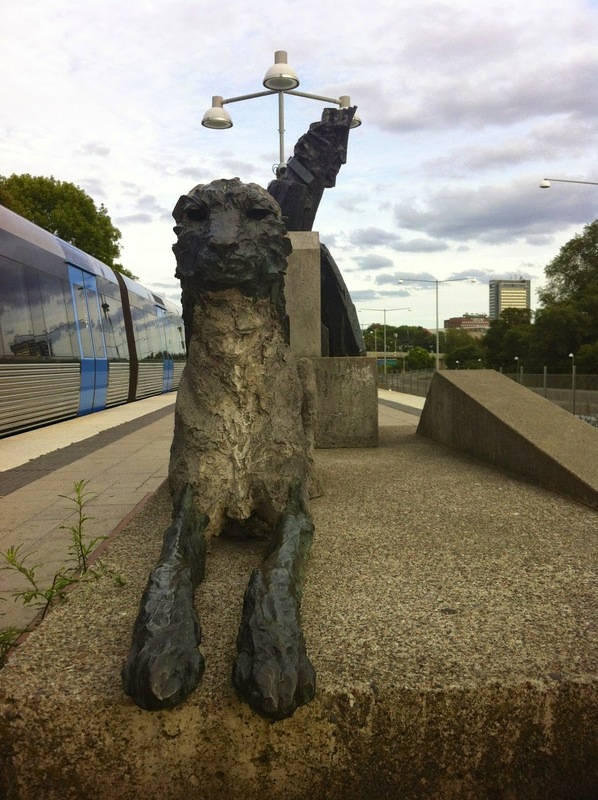 I read on the artists website that this sculpture is meant to be Virginal Woolf. 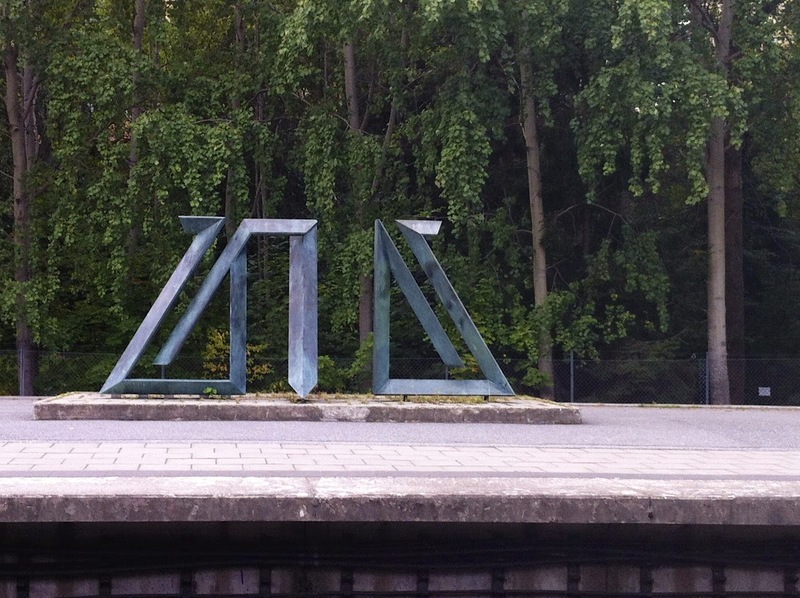 I have friends that live at this stop at Kristineberg or I probably would never have made it to this particular station, it has two really good parks on either side of the train tracks as well. The colors on this are really cool, but I could not quite capture the coloring with my phone. I am guessing these are made of copper, and I wonder if anyone got photos of them before the elements changed them. I couldn't find the plaque though. It is a transfer station so there were a lot of people hustling around me. 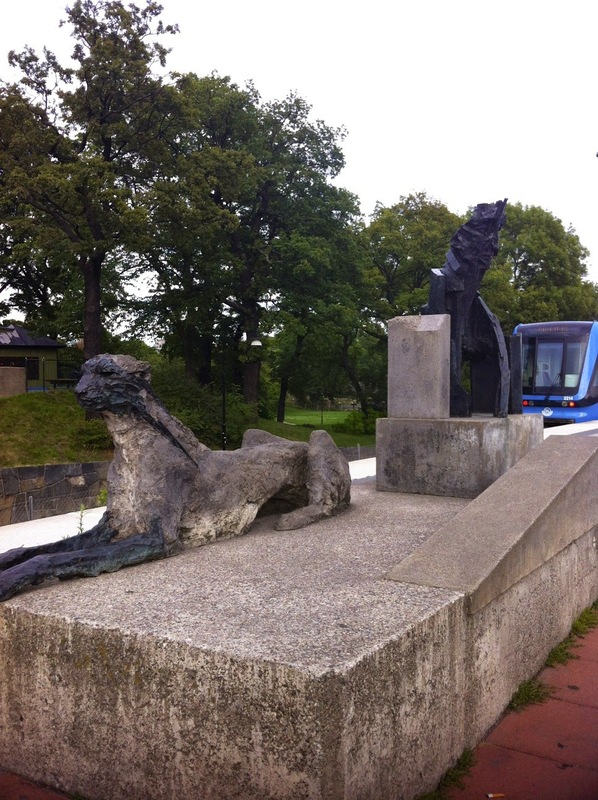 I had high hopes that Skärmarbrink's sculpture were meant to be seen through one another. I may have built this up in my mind because this is the last transfer station on my way home, which means the train gets quiet as the last of the large groups exit. And I never want to get off here, so I have been building an expectation all summer. 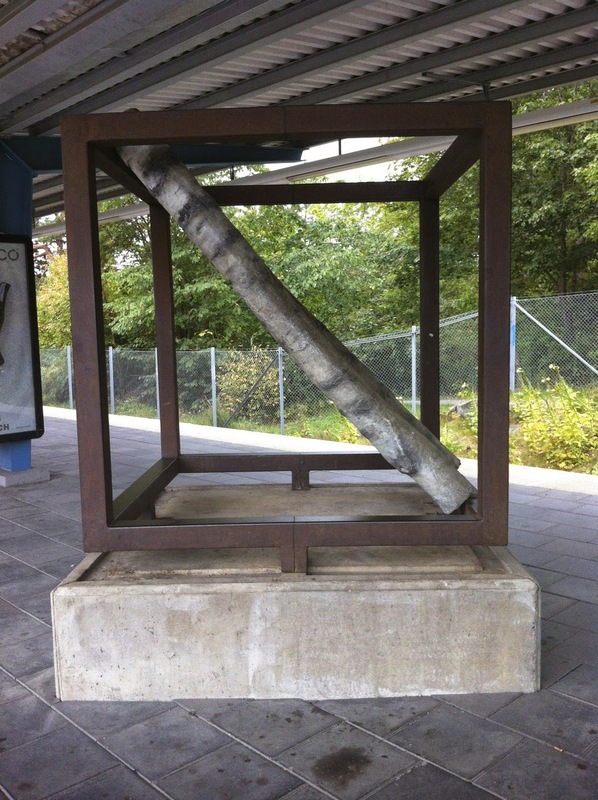 When I attended University in Bellingham, Washington, near the end of my time there, I took this great class on 'perspective' and one of our lessons was going around to some of the modern art that is trailed throughout the campus. 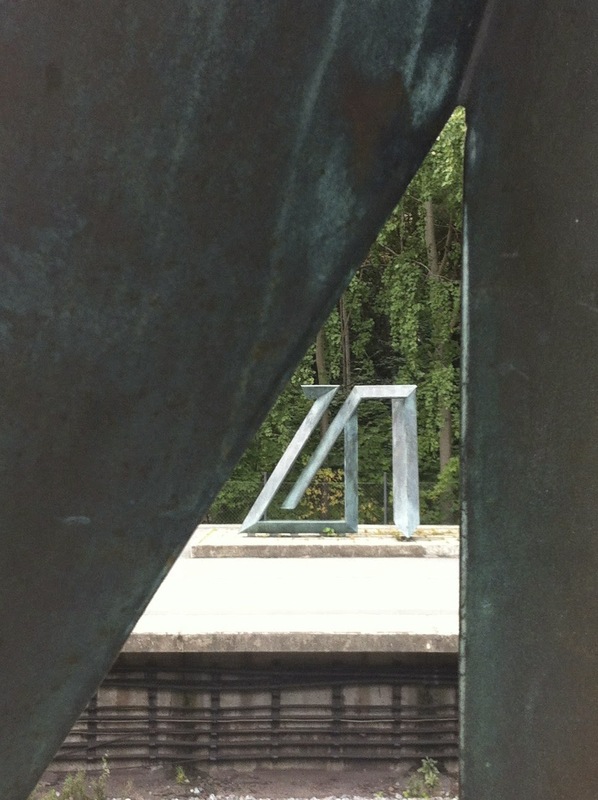 In the main quad of the campus was a large open box tipped to stand on one point. 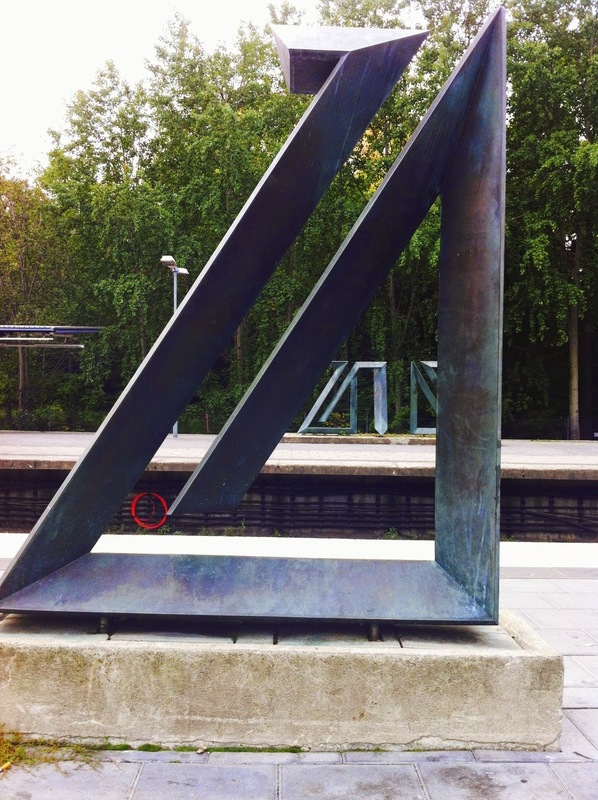 What I found out was that the sculpture was meant only to be a frame, a person was meant to stand inside and view the sky, thus framed by circle and square. That fact that I almost missed out on the experience through my haste, has forever changed my outlook. 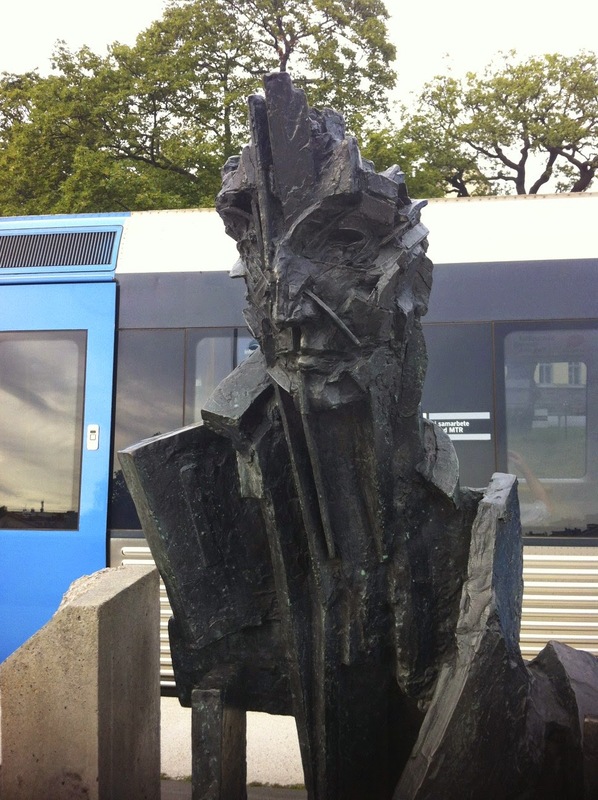 I thought I might just write up the whole artist plaque from this station, to give an idea of how they are written. 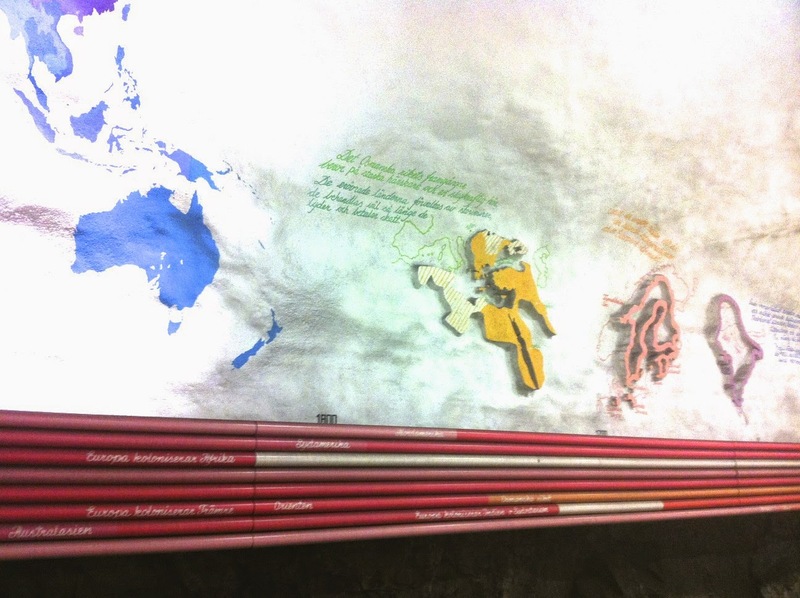 "The artists have transformed the station into a historical textbook in the form of a timeline with corresponding maps. The time axis streatching from the pyramids of time to our day with texts and maps to show the development in various fields. In one track, it can see by the wall track the reading of history in a time axis to the present day. 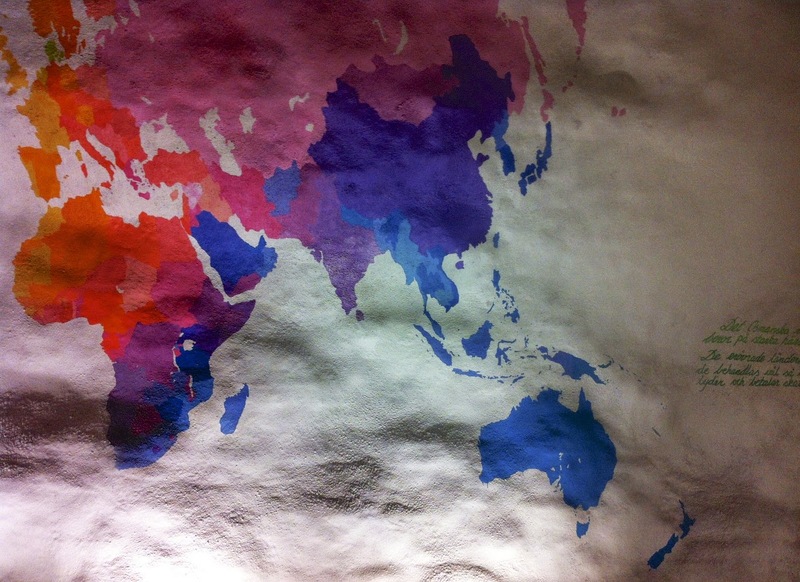 To make the history lesson lighthearted, religion is in gold, art is blue, culture is purple, politics in green, and everyday events are in red text. 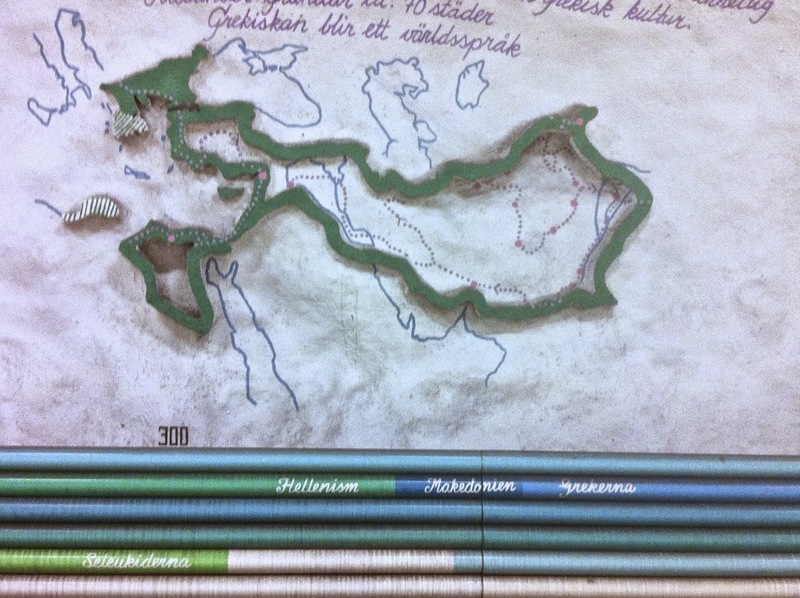 On the other track are pictures showing what the lyrics describe, for example the spread of the Roman Empire. 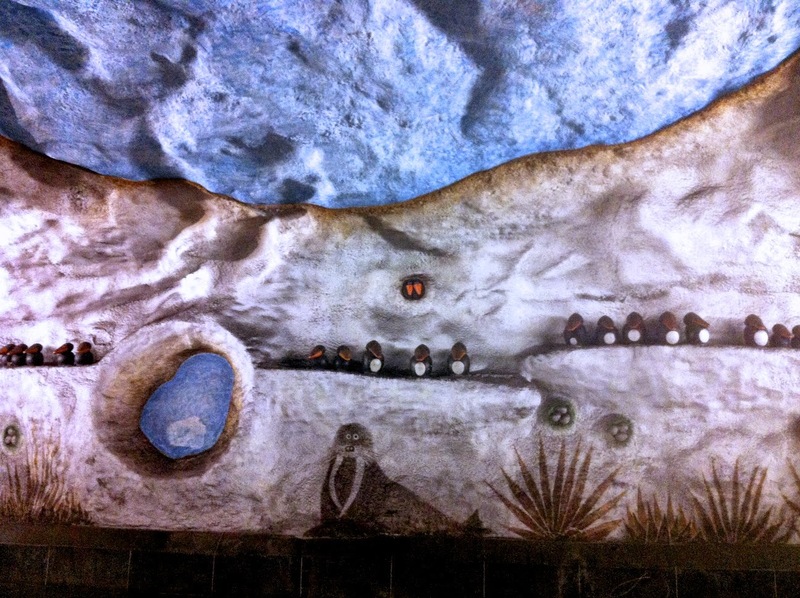 The artists have the theme of 'Meet you at the 1400s', and made use of the station so that it provides a stimulating and remarkable experience, here deep down in the underworld. A unique, yet particular general education of artistic representation." For me these photos cause a small feeling of regret, this was my second to last station, and I was ready for a break- so I did not try to read the walls closely, but now I would like to see what they really wrote from beginning to end. I did go upstairs to see if there was anything else but there wasn't, and this station is very deep down. 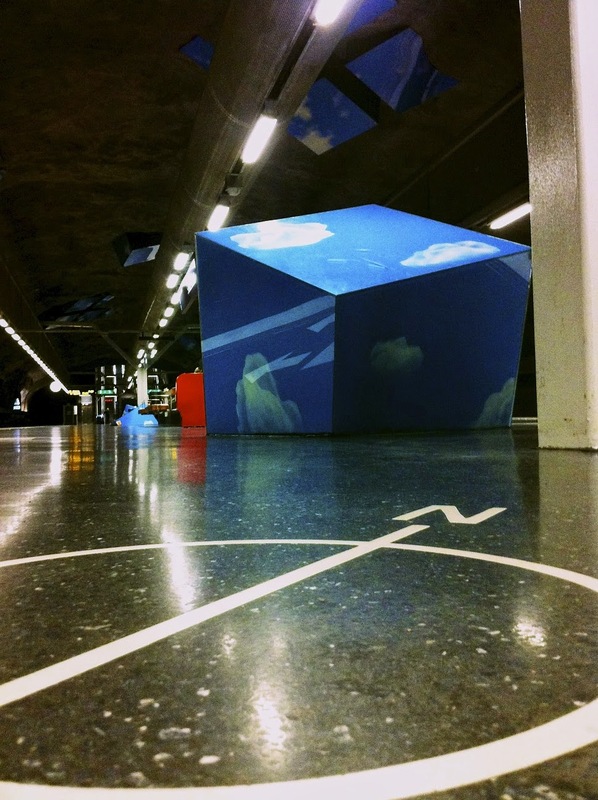 As I came back I was more struck with the 'feeling' of the station; which I think comes from the small details of the colored benches, and the inlay on the floor tiles. The station was a very pleasant one. "...I can't stand a naked bulb any more than I can stand a rude remark or a vulgar action..."
Last night I went back to the Bio Rio to see the streamed, last night of the Young Vic's Young Vic production of Street Car Named Desire. The Swedish translation for the title was 'Linje Lusta' which just doesn't quite get the meaning across in my mind, I believe that Linje does denote a train line- and if you put it into a system such as google translate, it does come up as the english title. Maybe this is unimportant- plays seem to transcend their cultural origins. In my mind when I read this play I picture actual places in New Orleans that when I saw them, made me think of the play. I am not sure a deeper visual depth is necessary. I really loved the stage set, and I was pretty good with the use of music (Pj Harvey, Hendrix, Catpower) to change scenes, although that and the ‘colgate’ toothpaste really set it up as so ‘modern’ or is the word contemporary? The revolving of the stage during Blanche’s ’spells’ was really effective. But better than the cinematic equivalent which always moves so fast I just feel that I am taken out of the scene. I can see why the New York Times critic Matt Wolf said “ A Blanche That Gives As Good As She Gets” because Gillian was a strong and loud Blanche, which made the final unraveling that much more poignant. Interestingly, Tennessee’s language did not seem dated even though it was juxtaposed against the modern setting and music. I do think though the streamed audience viewers might have gotten the ‘best’ sight line and also audio via the cameras, I did not suffer any of the frustrations that the reviewers seem to mention, although the first couple of minutes were marred by buffering, thankfully that got sorted out, thanks I am sure to some technician someone in London. I am assuming by the time, in the 1970s that the subway made it to this location, the area was viewed as an immigrant area. 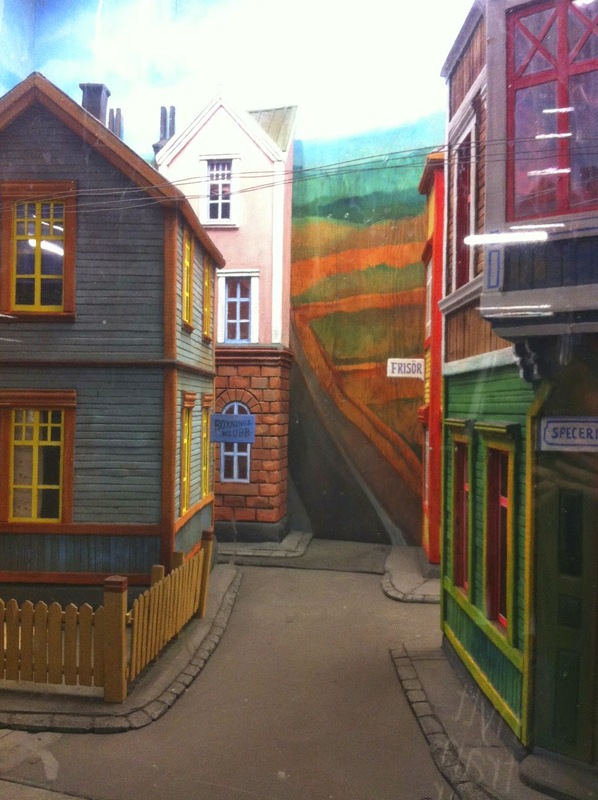 While Stockholm seems to me to be becoming more and more diverse, I will say that there are neighborhoods if one visited just that neighborhood their impression of Stockholm would be skewed. 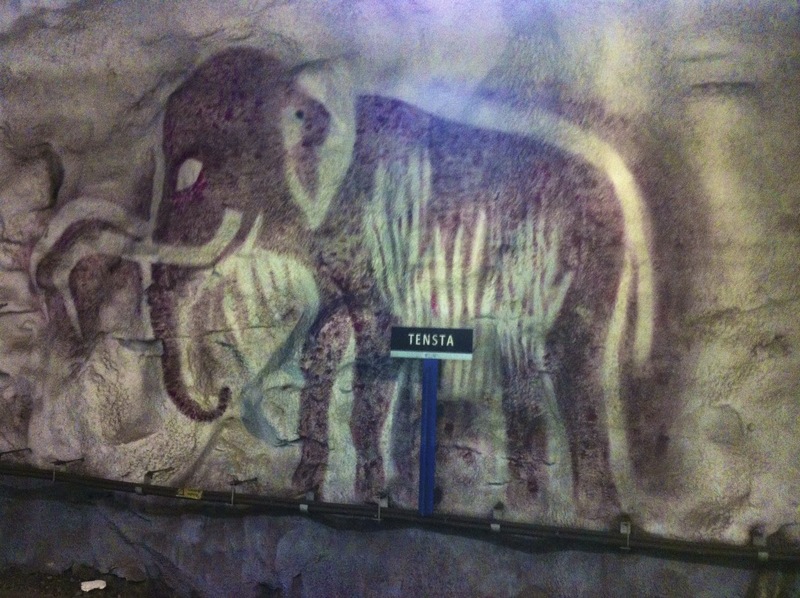 Of course, many would perhaps argue that Tensta is not really Stockholm, although technically it is in the city limits. I only have my own (albeit) limited perception but the area did seem to be an immigrant area, of course, this could just be people whose grandparents were born elsewhere, or perhaps there is immediate housing for people that are newly immigrated, if the article is correct a few years ago, the percentage of kids in school here was 95% of foreign origin. 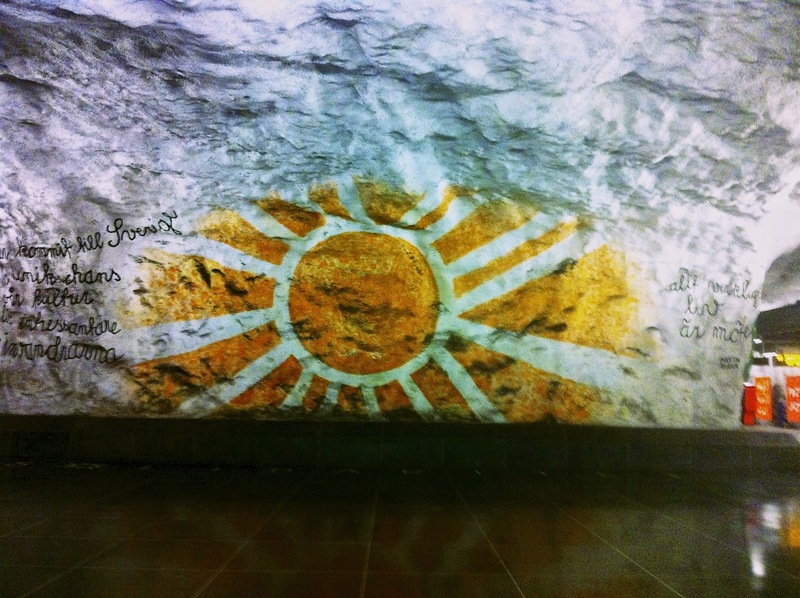 - So, it was interesting to me that artist chose so long ago to create a happy, bright, welcoming station via her artwork, and text in different languages and that it is still relevant. 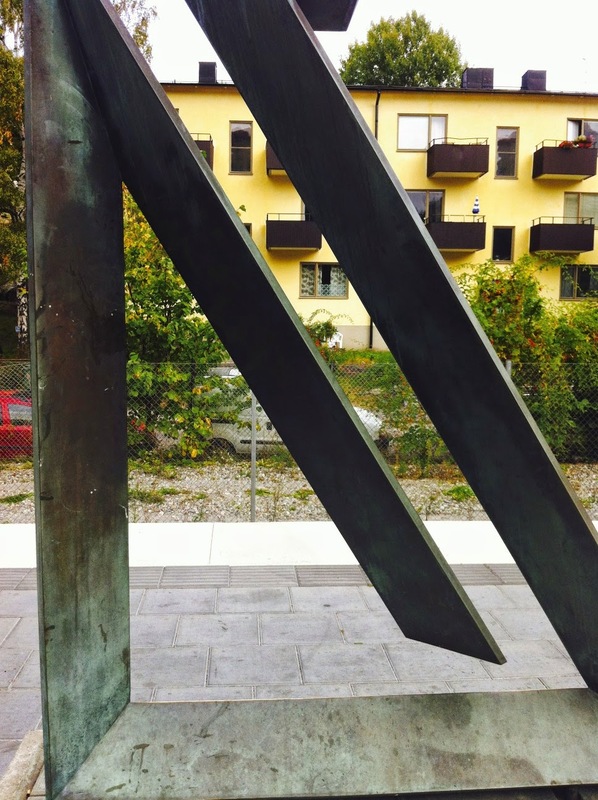 The plaque states that the art is for those who live here and "a rose for immigrants, solidarity and brotherhood" or at least that is the literal translation. Of course, all I saw were people rushing by without a glance, expect to glance at me as if I was strange to be pausing and taking photos. 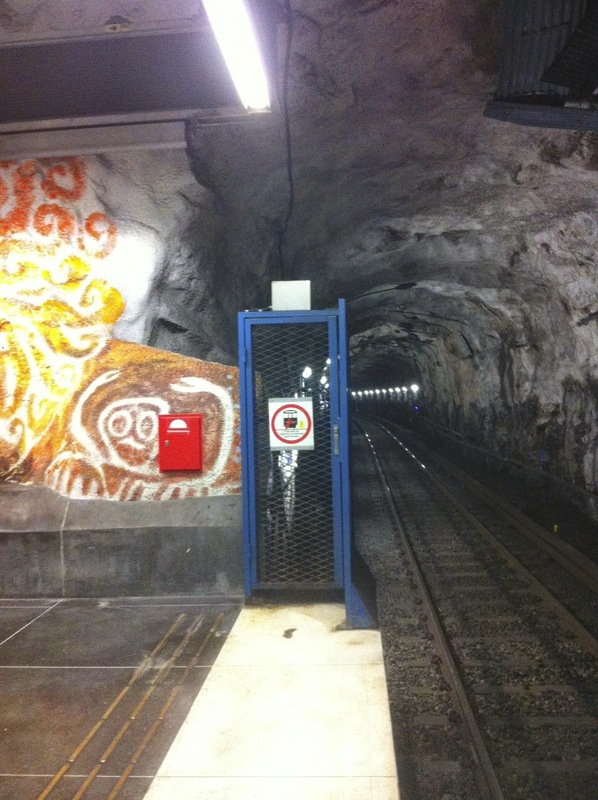 Also, I have a fondness for the stations where you can clearly see down the train tunnel. 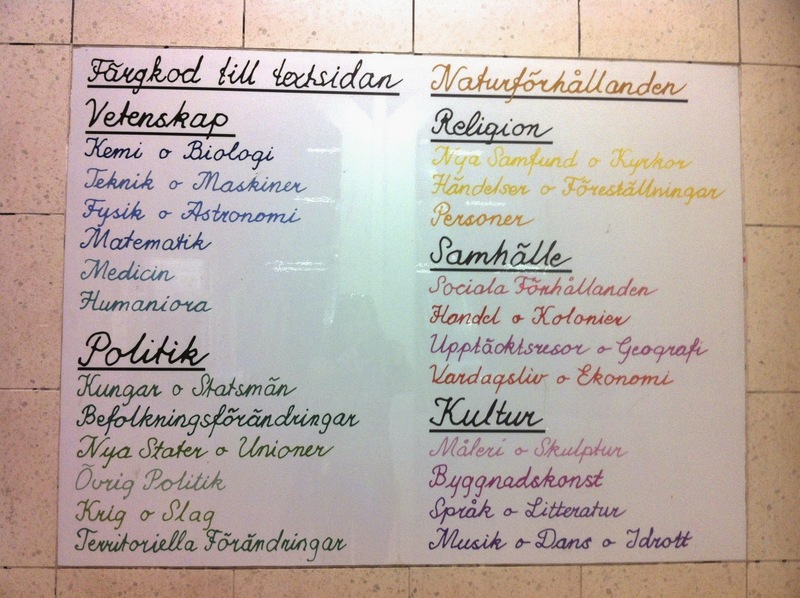 I decided to go ahead, and in an organized fashion, go to the end of the Hjulsta blue line. I do go out this way, as there is a good neighborhood to go thrift store shopping. But of course when I go shopping I never make it past that stop and I wanted to spend more time in five of the stations. One of which, pictured here has had a name change. I was unimpressed with the new signs, and now I am recommitted to going back to the one station I know has original signs. 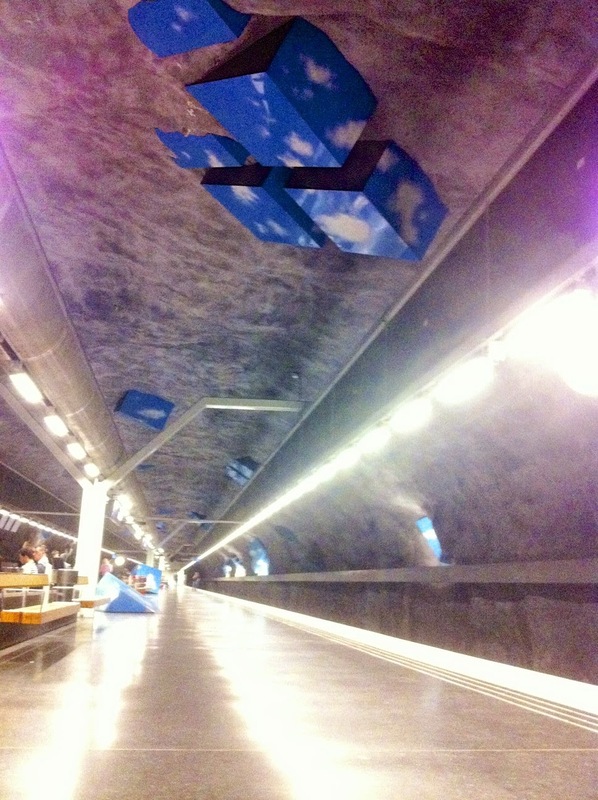 I thought I would throw this one in quickly as all I could find was platform art, but unlike many of the other stations with just platform art, this one has the block cloud theme all the way down the platform. 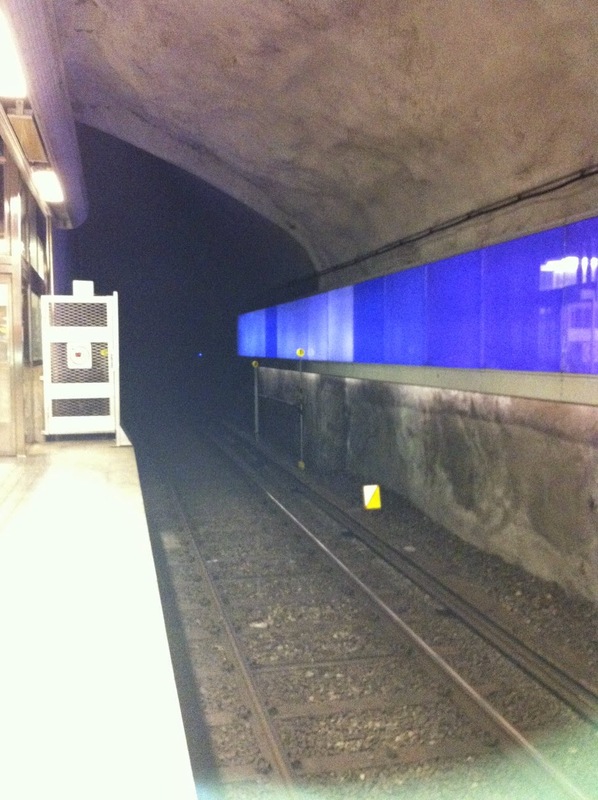 However, when I went all the way out, (there was only one exit) the only other piece I saw was a plain dark cube all the way outside the station. I was unsure that the cube was connected. Upon reflection... as I type, I realize that the plain cube of course was under the blue (alas cloudless) sky, and the cubes way down underground, are all painted with sky. I think I just found the connection. 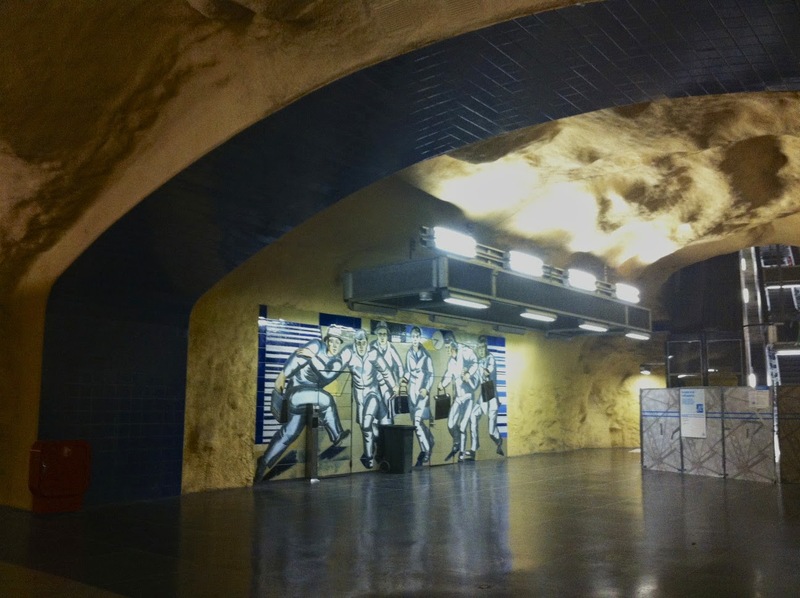 Solna is one of those stations near a Sports venue, which means most times when I go there I am going with the flow of a large crowd of people. Therefore, my usual cry of 'Moose!' (there is a large one encased in glass...alas blocked this time by constructed walls) has been ignored, as I was bustled along...late for Roller Derby practice, Roller Derby scrimmage, Roller Derby set up for a bout...(you get the idea). 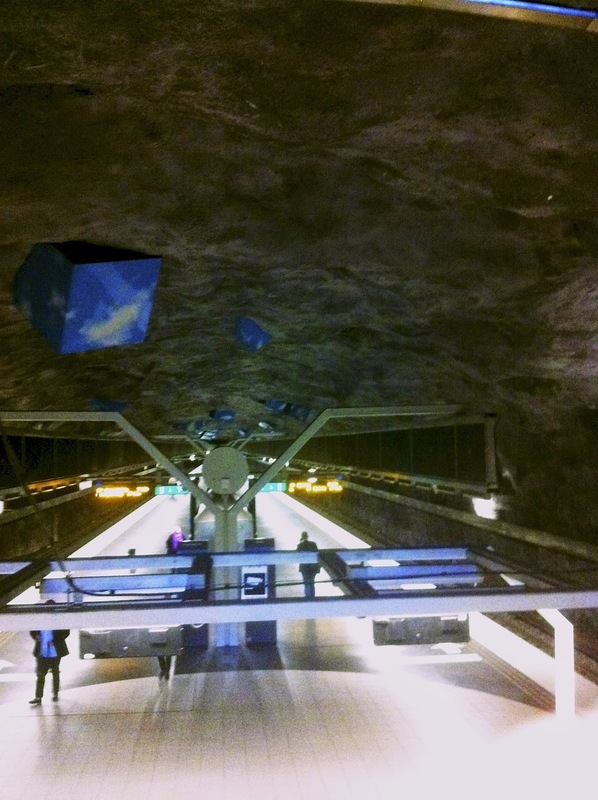 So although I have been to this station many times I have never been there alone. This time, I had to leave the STRD Roller Derby bout just as it ended, so I was taking the train alone, but sadly a lot of the station was partitioned off for some sort of construction. 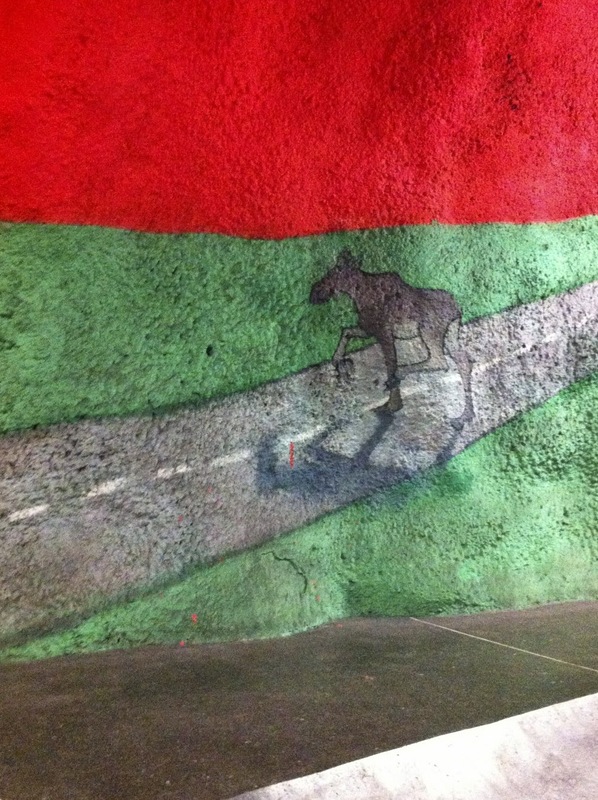 This means I only got to see about a third of the art, and most disappointing was that the large Moose was blocked off. He is behind a large pane of class near the escalators. I will have to hope the work is done by October when I return for the 'Megaloppis' or as the Americans would say a large flea market/antique fair. 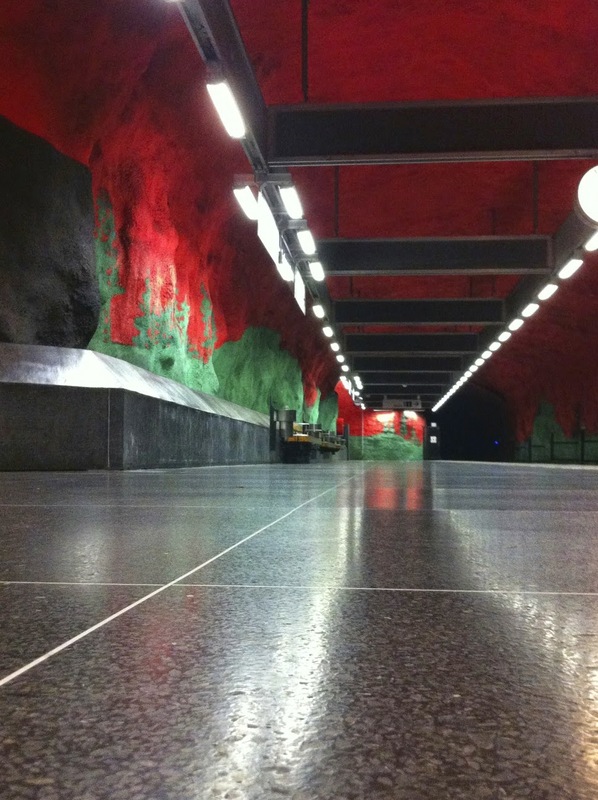 I did not do anything to the color of these photos, the red really is this bright, even though this station is one that is deep underground. 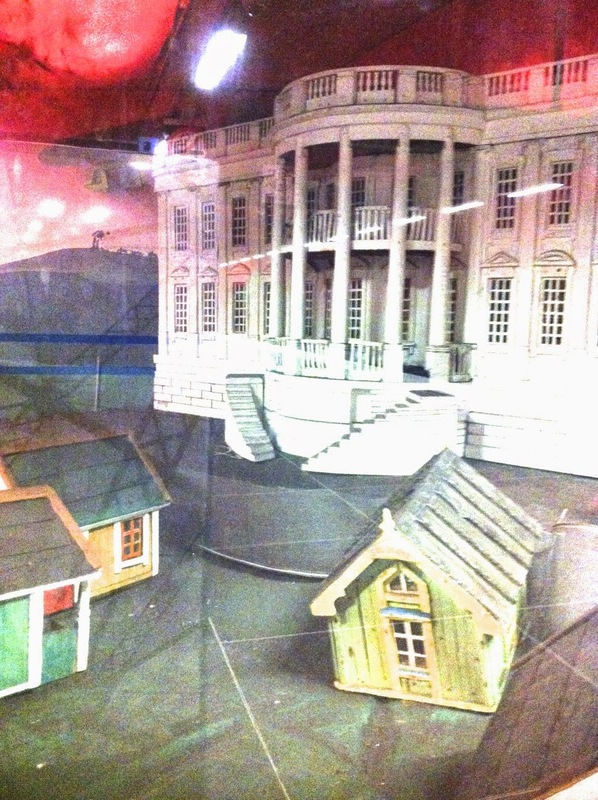 Most of the glass enclosed small building scenes were blocked by construction. The walls have many of these countries scenes as if they were the roads and through ways to each glassed enclosed center.